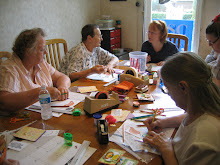 Don't forget to call and register for December's "Almost Free" Make 'n Take. Reservations are required. When: December 6 from 5-8 p.m. and December 7 from 10:30 a.m. - 1:30 p.m. Cost: $2 per person donation to High Springs/Alachua Relay for Life AND one non-perishable food item for the Catholic Charities Food Bank.